Buying a truck is difficult. This year the Chaos Communication Camp will take place at Ziegeleipark Mildenberg. It is a great event for nerds. But there is a problem: it is a camp. I own a tent, which I used previously. But my girl friend decided that she does not like tents. Houston, we have problem. So out of the blue I looked around for alternatives to a tent. I asked friends who own a camper. But unfortunately this camper will not be available at that time. Renting a camper will become very expansive, because the camp takes place at the high season. So, what are the alternatives? One alternative is buying an (old) camper. But then what, should I do with this camper afterwards? Presumably, I will not need it that often, because I am not on camping that often. I am traveling by plane. Selling the camper would be an option, but is connected to some risk. Another alternative is buying a (cool) truck to use it – as I call it – as mobile tent. Which means, it does not have to offer the same amenities like a camper, but kitchen, shower and alike. It still offers are good place to sleep in like a tent. The truck itself has to be cool and an eye-catcher. An eye-catcher would be some kind of a historic truck. Especially, as I plan together with other to build a car hacking village. 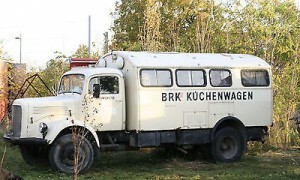 A historic truck with no electronics as a contradiction for the car hacking village. Another advantage of such a truck could be the reuse as a Food Truck. A food truck to be used for special events. 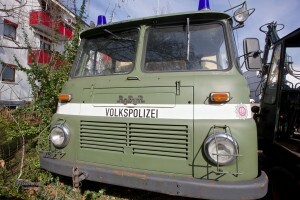 Looking around I found the best truck that fits that purpose: Robur “Volkspolizei der DDR” a former truck of the police of the former German Democratic Republic (GDR), which broke after the falling of the German Wall. As a former citizen of that country it makes complete sense. The reuse case would be to add a field kitchen and to provide meals in an appropriate environment. But then, visiting that truck I recognize: it is not original. Originally it was used by a fire department. It is has no papers and it is in a much, much worse state than advertised. Now looking around for alternatives is not as easy, because you have this original story in mind. Sometimes after that I got the message and I found this one. 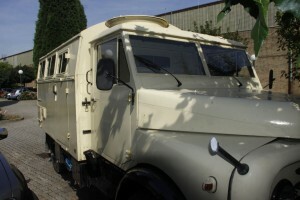 It is a Hanomag AL 28, which was repurposed for repair services. The offer was available for some month, but when I called, it was sold just a week a go. OK. Maybe I still have a chance to get my hands on, because the buyer has not paid it. But I have to consider it to be gone. That means, still looking around for an alternative. The are lots of trucks available as fire fighting trucks. To be honest, as there so many available there is missing a feeling for it. Missing a feeling what to do with it. Then, just the other day I found another truck used as a kitchen. That made my feelings come back. That truck is cool. But. But after investigating this truck, it was not only repurposed as a camper, but also it has a lot of corrosion going on. Buying a truck which gives you a feeling is extremely difficult. Because, I don’t want to buy just anything. I want to buy a truck, which has a feeling. A truck, which I like. A truck, which has some heritage. A truck, which has personality. BTW: My girl friend has giving names to all those trucks. The police is called Heinrich. And sometimes still today we refer to it as Heinreich. The second I called Max. The third is called Clara-Clementina.